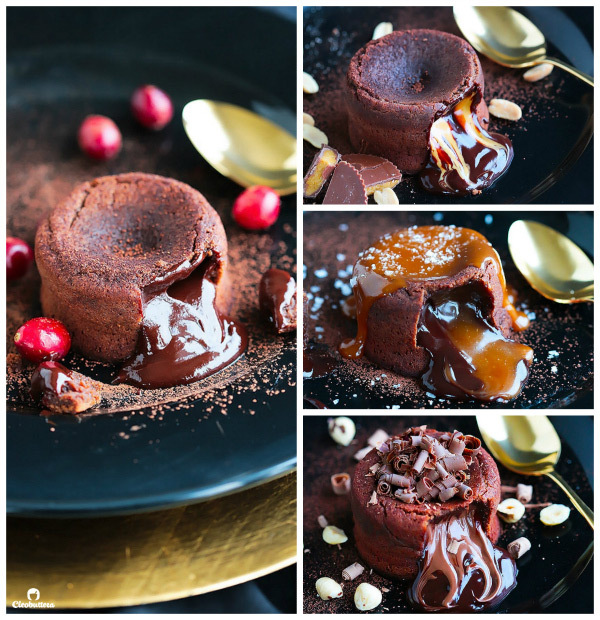 These Decadent Molten Lava Cakes flowing with 4 different fillings, give the restaurant version a run for its money! 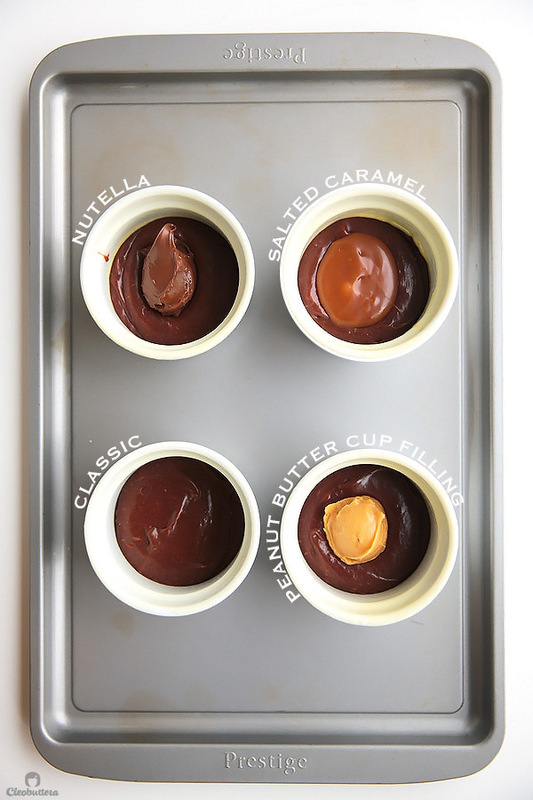 Choose between peanut butter cup filling, salted caramel, Nutella, leave it plain for the classic OR make one of each. ONE bowl, NO mixer, so QUICK & EASY to make, and could be prepared a day ahead! HEY THERE FRIENDS! I’ve missed YOU!!! I really do! Your chocoholic blogger from Egypt who has a hankering sweet tooth and an obsession with stuffing sweets into other sweets, but has left you a month and a half with no new recipes? Does this ring a bell? How about this? Then this for sure! No? This? Nothing? Can’t blame you…I’m the one who got swallowed up by life’s daily grind, which turned a few days of a blogging break into an unintentional hiatus. The thing is…I take recipe sharing very seriously, which makes me very selective of what I post here. So if a recipe doesn’t turn out the BEST it could possibly be, then I’d rather not share it all. Even if that’s at the expense of not updating the blog with a new post for a few weeks. I know how spending a lot of time, effort and money on a recipe, only to end up with something that is just “meh” feels, and I’d hate to be the cause of this type of frustration. I might not blog everyday (even though I wish I could), but when I do, it has to be worthwhile. A recipe you could trust. The BEST I could possibly offer you. So while non of the Red Velvet Cupcake recipes passed the test for perfection, these Molten Lava Cakes have. With flying colors! They are super chocolatey, rich without being heavy and laden, with just enough sweetness to satisfy kids and adults alike. The outside is a cross between cake and a fudgy brownie and the inside is puddling with the best kind of lava. 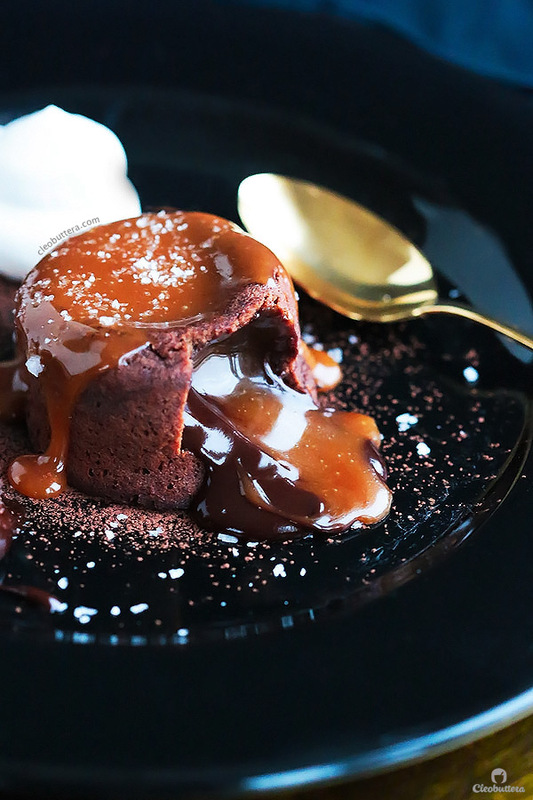 Not only is this the most perfect and easiest Chocolate Lava Cake recipe I’ve tried over the years, but this version right here comes in four different flavors. You could never go wrong with the classic. Oozing with a river of silky chocolatey goodness, just like the one we go crazy over at fancy restaurants. If not better. Pure and unadulterated. JUST CHOCOLATE. Simple but splendid. 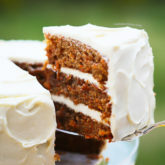 But for those times when you want to kick things up a bit, a dollop of your favorite spread or sauce can transform the classic cake we know and love, into an elevated experience. Here, I’ve used my personal favorite flavors in the world; salted caramel, peanut butter and Nutella (duh! ), but I’ve added other suggestions down in the recipe details, in hopes of satisfying most tastes. 2. THE PEANUT BUTTER CUP. Peanut butter and chocolate? I mean…who could argue with that? But instead of simply adding pure peanut butter straight from the jar, which I’ve tried and found to be too heavy and lacking sweetness for my taste, I made a simple paste that tastes just like the inside of a peanut butter cup. Even better right? If you’re a peanut butter lover, this will easily become one of the best desserts you’ve ever had. Homemade salted caramel adds savory notes, depth and extra yumminess to what is already a decadent treat. This might just be my favorite of the four flavors. I think. That is of course if you twist my arm to pick just one. 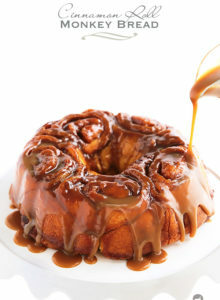 You could use storebought salted caramel or make this one; its to die for! A sprinkling of sea salt flakes, cuts down the sweetness and tickles the tongue. AMAZING! You didn’t think I’d let this one go without stuffing it with Nutella didn’t you? If you know me just a little, then you know I can’t leave much alone without smothering it in Nutella and this one is no exception. If you’re a sucker for the chocolate hazelnut goodness as I am, then do yourself a favor and make this one. Trust me. Making these impressive cakes are a lot easier than you think. 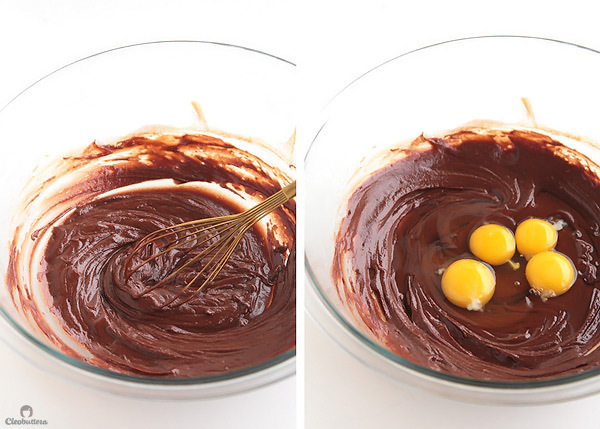 They come together in 10 minutes, in ONE bowl and don’t even need a mixer. They are one of these dump and stir kind of recipes, but the outcome will drop jaws. FIVE ingredients are all you need to make this restaurant specialty. Good quality dark (or bittersweet) chocolate, butter, powdered sugar, eggs and flour. Good quality chocolate is key to this dessert, because it’s all you’re tasting. There’re nothing much to cover it up. Use dark chocolate with a cocoa content of at least 52% for a less dark, more kid-friendly version, but go as high as 75% or 80% if you prefer the flavor and bitterness of extra dark chocolate. 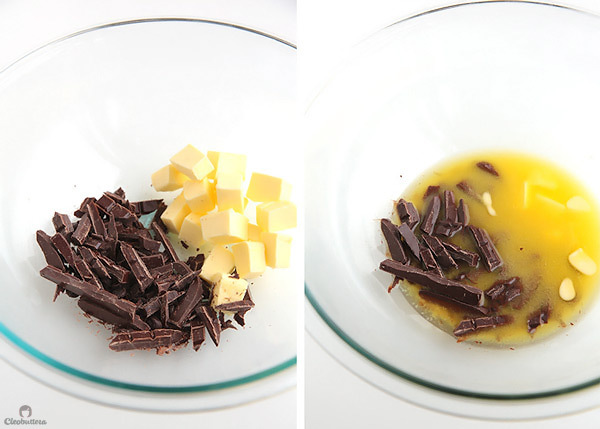 Chop the chocolate up then microwave it with some butter for about 1 minute. 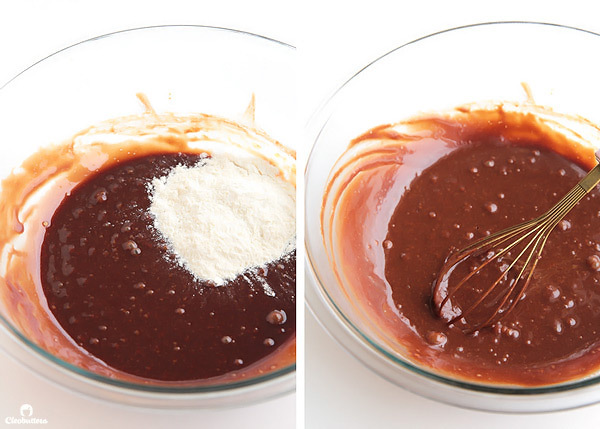 Whisk them together until everything melts and becomes smooth. Then add in the powdered sugar. Whisk that in, then add 2 eggs plus 2 egg yolks. Mix these guys in. Then stir in the flour. That’s it! I told you that making the batter couldn’t be easier! You’ll then divide the batter among 4 sprayed ramekins or custard cups. The disposal aluminum foil ones are OK too. Reserve some of the batter aside. 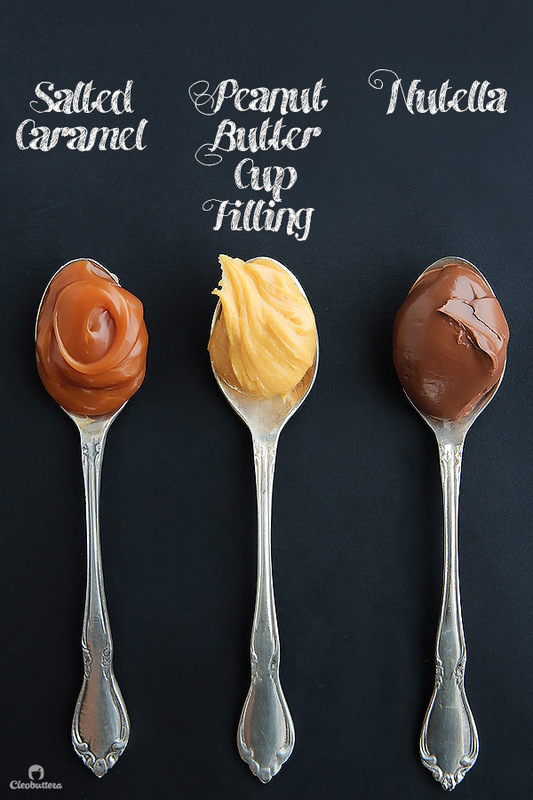 Then plop right in the center, 2 teaspoons of your preferred spread in each one. I made one of each! Because I’m indecisive when it comes to food. Use the reserved batter to cover up the fillings. Here’s the only tricky part of the recipe😬 The baking time! You’ll want to bake these babies for 12 to 14 minutes, until the edges are firm and spring back to the touch but the center is still soft, but not super jiggly. I bake mine for exactly 13 minutes, but baking time will vary based on ovens, ramekins, and climate variances. Do NOT overbake or you’ll lose that molten lava center. Don’t worry if you don’t get it perfect the first time, it might take a few tries till you find your MAGIC baking time but it will still taste great! And when you do, you’ll be rewarded with a gourmet dessert kissed by your favorite spread or sauce. Or all 4 of them! And no one needs to know that they were so quick and easy to make. Let them think you’re diva you truly are! Watch a quick video of the making of these cakes on my Instagram account. 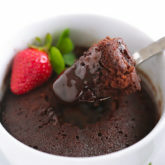 For a similar microwave version and readers’ favorite, be sure to check out this Molten Chocolate Mug Cake. 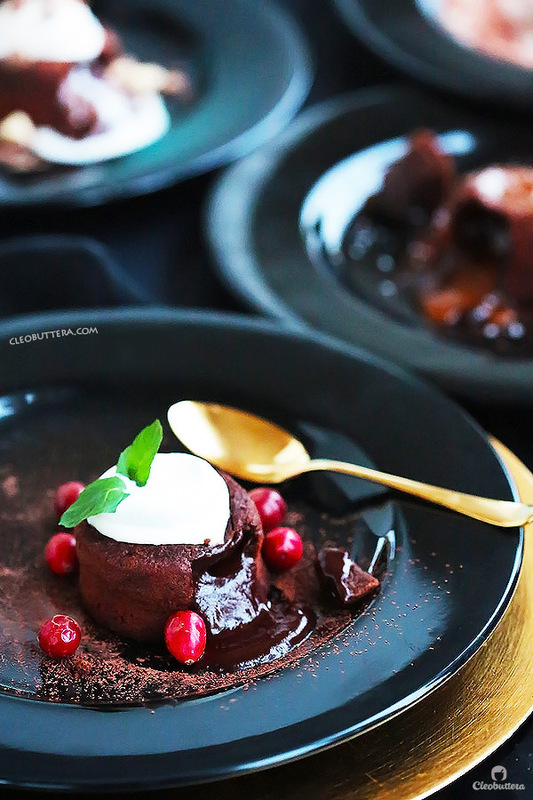 These Decadent Molten Lava Cakes flowing with 4 different fillings, give the restaurant version a run for its money! 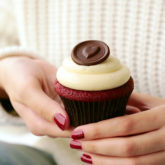 Choose between peanut butter cup filling, salted caramel, Nutella, leave it plain for the classic OR make one of each. ONE bowl, NO mixer, so QUICK & EASY to make, and could be prepared a day ahead! Please see NOTES below for making ahead instructions. Ice cream, whipped cream, extra salted caramel sauce, sea salt, hot fudge sauce, chopped peanut butter cups, berries and mint Leaves. Adjust oven rack to middle position and preheat oven to 425F/218C. 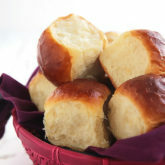 Spray four (6-8 oz) ramekins or custard cups (glass or disposable aluminum foil) with non-stick cooking spray. 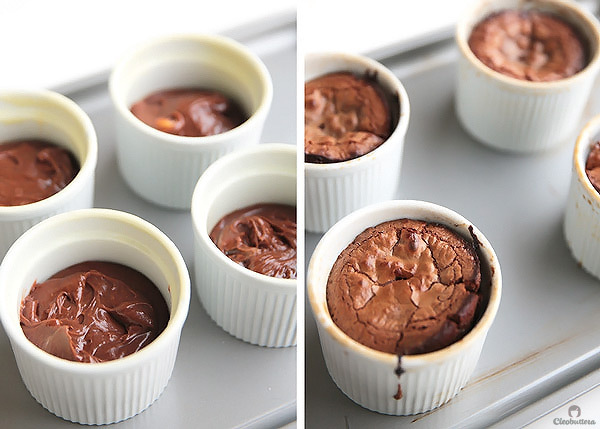 Alternatively, butter the ramekins or custard cups, then dust with flour or unsweetened cocoa powder. 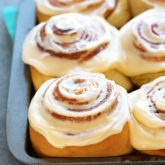 Place them on a baking sheet, then set aside. 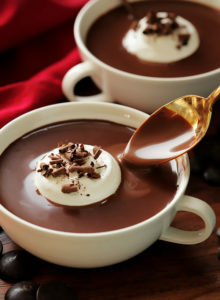 In a medium microwave safe bowl, combine the chopped chocolate and butter and heat in the microwave for about 1 minute, stopping and stirring every 30 seconds, until the butter and chocolate are almost melted. Continue to stir, allowing the residual heat to completely melt the chocolate and the mixture is well combined and smooth. 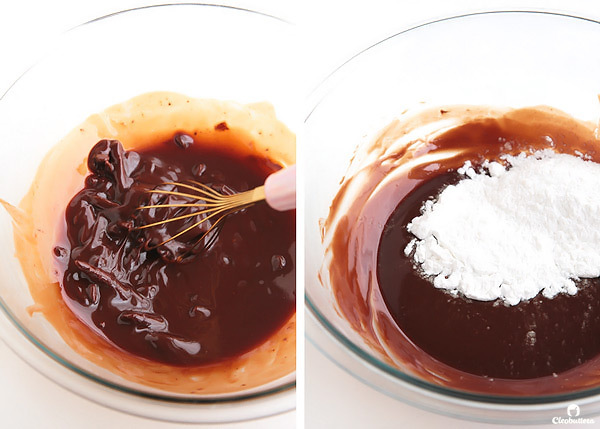 If needed, return the bowl to the microwave for a few more seconds, to completely melt the chocolate. Add in the powdered sugar and whisk until fully incorporated. Add in the eggs and egg yolks and whisk until well combined. Add in the flour and whisk until smooth. Divide the batter evenly among the 4 prepared ramekins/custard cups leaving less the quarter the amount of batter behind in the bowl. I like to use an ice cream scoop for evenly dividing the batter. 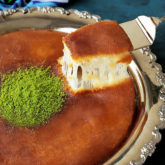 Add 2 teaspoons of your desired filling in the center of the batter (or leave it plain), making sure that the filling doesn't touch the sides of the ramekins/custard cups. Pour the reserved cake batter evenly on top of each filling so its no longer visible. 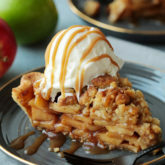 Transfer the baking sheet to the oven and bake for 12 to 14 minutes, until the edges are firm and spring back to the touch but the center is still soft, but not super jiggly. 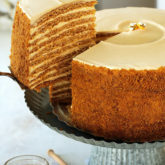 Note that the caramel filled cake takes a little longer than the rest to bake through. I bake my cakes for exactly 13 minutes and the caramel-filled one for 14, but baking time will vary based on ovens, ramekins, and climate variances. Do NOT overbake or you'll lose that molten lava center. Don't worry if you don't get it perfect the first time, it might take a few tries till you find your MAGIC baking time but it will still taste great! Let cool for 2 minutes, then gently run a knife around the edges of the cakes to loosen. Invert onto the serving plates. 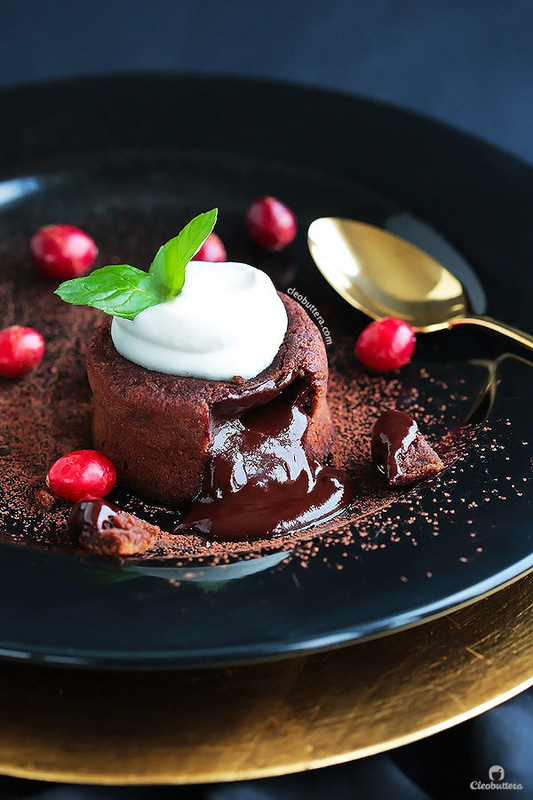 If desired, dust with cocoa powder or powdered sugar, then serve immediately while still very warm along side any of the serving and garnish suggestions listed above. Place the butter in a small microwave safe bowl, and heat in the microwave for a few seconds until melted. Add in the peanut butter and a powdered sugar and stir until smooth and has no lumps. Cover and chill in the refrigerator to set until ready to use. I used Lindt dark chocolate, Carrefour baking chocolate and Gourmet Belgian dark chocolate buttons all with a cocoa content of at least 52% for this recipe. The result was so chocolatey but not dark, and sweet enough but not so much so, making it perfect for both kids and adults alike. If you prefer the darker taste of bittersweet chocolate and less sweetness, I recommend using chocolate with a higher cocoa percentage. The higher you go the more intensely chocolatey and darker it will taste. Good quality chocolate chips may be substituted. To make ahead, prepare batter as directed; pour into prepared ramekins or custard cups. Cover and refrigerate for up to 24 hours. Let stand at room temperature 1 hour before baking as directed. Classic base recipe adapted from Averie Cooks, who adapted it from Kraft. 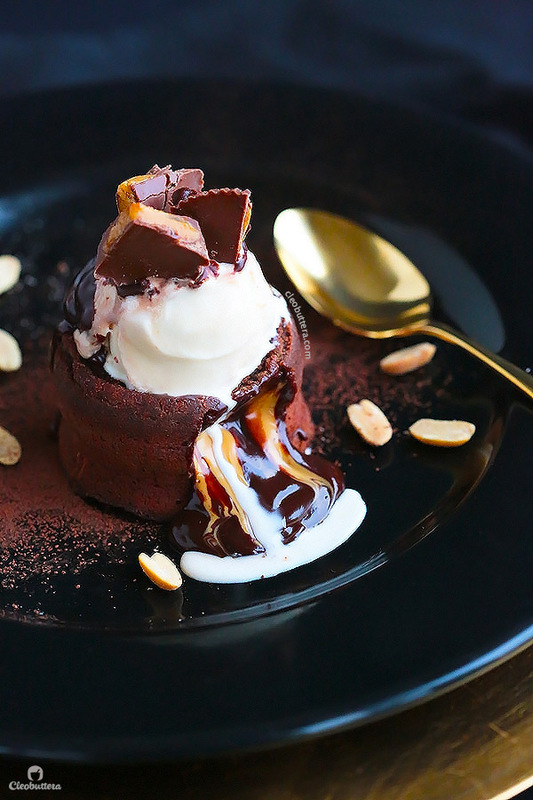 Two of my favorite food bloggers, Sally’s Baking Addiction and Dinner then Dessert, and I are coincidentally twining on Peanut Butter Lava Cakes, only a few days apart! Telepathy? Or joined by the strong force of peanut butter and chocolate love? No matter what it is, you should totally check out their recipes too! Yaaaay!!! I’ve missed hearing from you June! wooooooooooooowwwww LOVE!!!!! I want so badly right now. You are such a amazing baker. I am so impressed. Thank you Tooki! That’s HUGE coming from a person who is not the biggest fan of chocolate😉 I’m hoping that would change your mind. I’m so happy you’re finally back, the blogging world has been lacking some of your drool-worthy creation during these past few weeks! 😀 In the meantime I’ve tried around FIVE of your recipes from the blog. And let me just say that, thankfully, I’ve hand success with all of them. They were just so delicious, some honestly left my speechless. Thank you so much Mariam for that warm welcome. I really enjoyed following your baking adventures during the time I was off. You are truly an amazing baker & I see a HUGE future full of cakes & confections ahead of you. And how many Smart points do these have? Haha! Glad you are back. Ugh Cindy are you sure you wanna know? Get ready for this. Here goes…the classic one is wait for it…wait for it…28 smart points🙈 That’s almost as much as my daily smart point budget lol😂 Here’s where the weekly points would come to the rescue. I never ate a full one though. I mean I could’ve, but I behaved myself. Are you on Weight Watchers too? If you are I’d love to know what you think of the new point system. 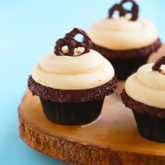 That peanut butter version looks like everything I have been missing in my life…DELICIOUS! Where do you get your “good quality chocolate” in Egypt? I tried to buy some local “for baking” chocolate here the other week, only to discover that it didn’t seem too much like actual chocolate–when I tried to melt it, it became a paste rather than liquid! 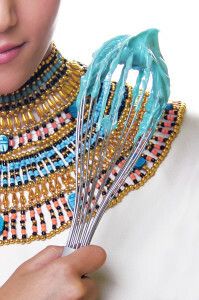 Unfortunately, Egyptian baking chocolate are not of really good quality. It is mostly sugar & very little cocoa content. I stopped using them a long time ago & never looked back. Currently I love using Carrefour Dessert Chocolate 52% cocoa which is imported from France & sold at Carrefour. The taste is excellent & it is reasonably priced compared to the Belgian & Swiss chocolates. If you want to splurge, you could use Lindt dark chocolate, which ofcourse is amazing. Gourmet Egypt also sells Belgian Dark Chocolate coins which are of great quality & they have an online shop & deliver to your house. You have no idea how much I have been missing you and your blog. And what a way to come back. 🙂 I got so excited when you posted it that I went the same day to buy ghiradelli baking bar to use for the recipe. Now I just have to find a spare chance this wknd to make it. I even made salted caramel for it and I have it chilling in the fridge. I know life gets really busy and if you have to breaks I understand. But please never leave us. This blogging world would be empty without you. Iram can I just tell you how much I love you?! I know you’re probably thinking I’m crazy given that I’ve never even met you, but girl the support & love I get through you is just incomparable! Thank you so much for always believing in me & expressing your love. This means the world to me & it’s what gives me the fuel to go on. My blog posts might become more sporadic from now to be able to keep with life’s priorities, but girl I ain’t leavin’ you…I love you guys too much to do so. I don’t have ramekins or large disposable aluminium foil cups, but I do have aluminium foil cups the size of cupcakes. 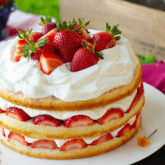 Can I make these in that? Also, would the baking time change if I do so? You could use those but it’s important to note that they are half the size of the large ones. That means that they’ll make 8 small servings instead of 4 large ones. The baking time will surely change, since they are now smaller so will bake up in less time. I’m sure exactly how long they should take, because I haven’t tried it myself but you’re gonna have to watch them carefully after 6 or 7 minutes. After that just make sure that they’re cooked all around the edges but the center is soft. 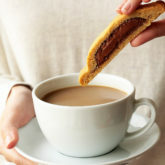 I suggest you do a trial test on just one of the cups first, so you don’t risk the whole batch. Welcome back Tasbih! 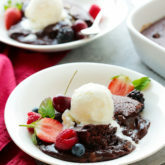 I’ve been dying to make the chocolate lava molten cake since you had posted it on ur blog. Unfortunately, I couldn’t find the ramekins or custard cups, as mentioned. Do you have any idea where I can them from? Thank you for your wonderful blog! Meanwhile, I suggest using the disposable aluminum foil kind in Falcon brand, found at just about any supermarket. 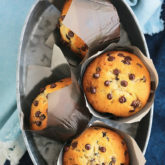 They are the size of a Jumbo cupcake & work just as well as ramekins & custard cups. 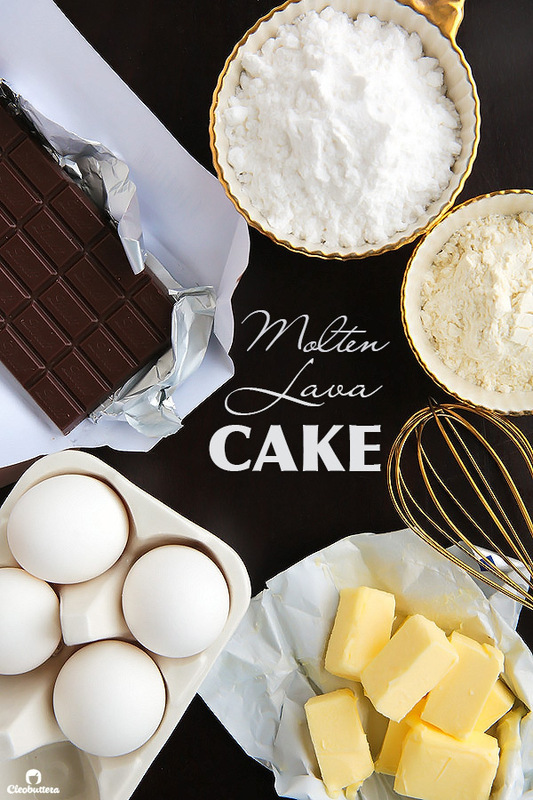 I just loved your blog and I just baked the Melton Lava cakes and they came out amazing! I just make the traditional and the Nutella. I have a question, when I have a leftover of the lava cake how is the best way to store and reheat ? Hey Juliana! Thank you so much for your kind words. I’m so happy you’re enjoying the blog as well as this cake. One thing I must really thank you for is the thoughtfulness of giving the weight measurements of the ingredients. I always struggle with finding baking recipes which look gorgeous but they were in cup measurements and after trying them out(with or without doing conversions), they usually ended up in disaster(i must admit that has to do with my amateur baking skills as well T_T). 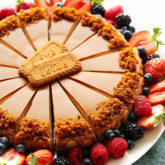 I would like to do this on Sunday for desert, can i use peanutbutter and jelly and would the prep for that filling be the same as if i was using plain peanut butter? Hi Nicole. Peanut butter and jelly is undoubtedly the perfect combo. I’m sure it will taste amazing paired with the chocolate. I agree with you on using plain peanut butter here, as jelly is already sweet. Yup! 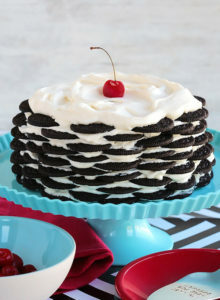 Just plop it in center of the batter like you would with any of the other fillings. 1. Can I substitute granulated sugar for powdered sugar? 2. Can I use 4 eggs instead of 2 eggs and 2 yolks? 3. I want to make this for Mother’s Day and I want to add a little something extra: cayenne and espresso powder. Do you mind suggesting how much of each I should use for one lava cake? Ok so I highly recommend sticking to the recipe the way it’s written, but if you really really must then I guess you could substitute granulated sugar for the powdered with a few improvisations. Please make sure that you use the same weight of sugar (4oz) and not the same volume. Powdered sugar is a lot lighter than granulated so if you substitute cup for cup, then it’s going to be too sweet. One cup of powdered sugar is 4oz while one cup granulated sugar is 7oz. So granulated sugar is almost 2X heavier than powdered sugar. Which means that you’re only gonna need a little over 1/2 cup of granulated sugar instead of one. If you have a kitchen scale, then just measure out 4oz. Also because granulated sugar won’t dissolve in the batter as easy as the powdered, you’re gonna need to first beat the eggs & sugar together with an electric mixture until pale & fluffy then fold in the chocolate/butter mixture. You are more than welcome ofcourse to add any flavorings or spices of your choice. I love the idea! Because cayenne is so potent I think you could just start with a pinch then taste the batter, and add more if needed. Same with espresso powder; it really depends on the strength of the flavor you’re gonna for. If you’re going for a mocha flavor, then I’m guessing 1/4-1/2 tsp should do the trick. But it’s really up to you. Enjoy & Happy Mother’s Day! A thousand thanks to you Tasbih. The recipe was amazing , I’ve tried many recipes before and this one went perfect 👌🏼. I followed your salted caramel recipe but I boiled the syrup for a bit longer time so they tasted quite bitter 🙈,so I had to serve them separately . A thousand thanks to YOU for taking the time to write your feedback. Love the recipe!! I have a little question, can I bake them in cupcake containers? Or do I need a bigger cup to make the whole recipe?? Thanks for sharing this delicius post!! 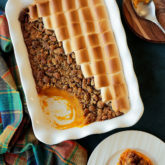 Hi I just love this recipe and I’ve made it beautifully several times..I’m just wondering if I could use milk chocolate as I don’t have dark on hand? Thanks! Hi Grace! So happy you like it. Technically you could swap milk chocolate for dark but boy will that be sweet. How about semisweet chocolate chips? If you have these on hand, they’ll work perfectly. I have tried this recipe twice and it has never failed me. Just one issue, while taking it out of the ramekin bowl, the bottom gets stuck and doesn’t come out clean. What should I do? Hi Manali! So happy you like this recipe. To avoid the cakes from sticking, make sure to generously spray your ramekins/dishes really well with non-stick spray that contains flour. The best quality earplugs for concerts are offered here which are of high quality, sturdy and comfortable to use. Oh that would be the highlight of any party for sure! Hope they turn out a hit. Hope you love it Pratik! 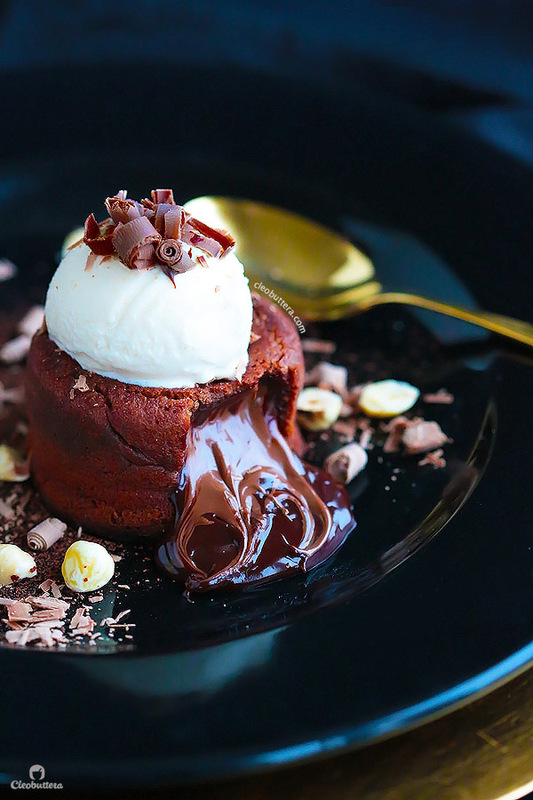 This molten lava cake is gorgeous thanks for posting.